In test cricket, a batsman’s most prior motive is to stay at the crease as much as he can, score as many runs as possible during his stay. 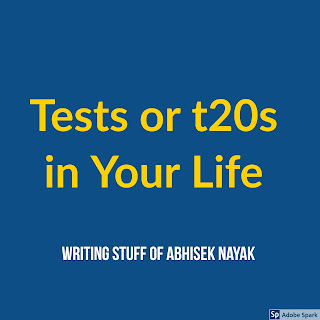 As we all know that it is not mandatory for a test batsman to score runs in a particular number of overs. So, it becomes very important in test cricket to wait for the playable deliveries from the bowler for scoring runs and defending or leaving the unplayable deliveries. If any batsman goes for the unplayable delivery for scoring, then he has a great chance of being dismissed and troubling his team. Can life be looked upon as test cricket?